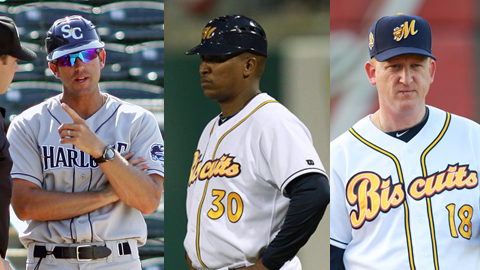 MONTGOMERY, Ala. - The Tampa Bay Rays have announced that for the first time in eight years, a new manager will lead the Biscuits; Brady Williams will serve as Biscuits skipper in 2014 and become the third manager in Biscuits history while Ozzie Timmons and R.C. Lichtenstein return as hitting and pitching coach respectively with Kris Russell also returning to Montgomery as the athletic trainer. Williams replaces Billy Gardner Jr., who was the longest tenured manager in the Southern League as well as being the all-time winningest manager in Biscuits history. Williams, 34, earns the promotion to Double-A after spending the 2013 season as the manager of the Rays High-A affiliate, the Charlotte Stone Crabs. Under the direction of Williams, the Stone Crabs finished last season 67-65, won the second-half championship and made a trip to the Florida State League Championship Series before being defeated by the Daytona Cubs. Williams enters 2014 with 14 years of professional baseball experience and eight in a managing or coaching capacity. The Rays first hired Williams in 2006. He served for three seasons as a coach in the lower ranks of the system before obtaining his first managerial opportunity in 2009 when he became the skipper of the Rays' short season team, the Hudson Valley Renegades. The following season, the Rays promoted Williams to manage the Bowling Green Hot Rods (Low-A). In his third season with the Hot Rods, Baseball America selected Williams as the 2012 Best Managerial Prospect in the Midwest League after leading Bowling Green to an 80-60 finish. Williams has spent eight seasons in the Rays system coming into 2014. The Biscuits new manager started his professional career in 1999 as a player when he was drafted by the Red Sox out of Pasco-Hernando Community College in the 45th round. The former first-baseman played five seasons of minor league baseball with the Red Sox, Twins and Rays. The bloodline of managing runs deep in the Williams family with Jimy Williams, Brady's father. Jimy managed for 12 seasons in the Majors for the Blue Jays (1986-1989), Red Sox (1997-2001) and the Astros (2002-2004). The elder Williams won the 1999 American League Manager of the Year award for leading the Red Sox to a 94-68 finish and a wild card berth into the playoffs. Gardner departs the Biscuits three wins shy of 500 in his Butter and Blue career with a 497-476 record. Through seven seasons with the Biscuits, his best year in the Capital City came in 2007 when the Biscuits rattled-off a team-record 81 wins en route to a Southern League Championship. The Biscuits, under Gardner, have finished with a record above .500 in three out of the last four seasons. Gardner has managed several players that went on to make huge impacts in the Major Leagues with the Rays including Evan Longoria, David Price, Jeremy Hellickson and Matt Moore. Timmons returns to Montgomery for his sixth season leading Biscuits hitters. The Rays first received Timmons' services in 2007 when he was on the staff of Hudson Valley. Timmons worked his way to Class-A Columbus the following year before beginning his career with the Biscuits in 2009. The Tampa, Florida native has 24 years of professional baseball experience, mostly as a player. Timmons started his professional career when he was taken by the Cubs in the fifth round of the 1991 draft. After debuting with the Cubs in 1995, Timmons went on to play for seven different organizations including his final season in 2000 when he was a member of the Rays. Many current Major League hitters were assisted by the direction of Timmons while in Montgomery. Some of these players include the 2009 Southern League MVP, Desmond Jennings, Jose Lobaton and Stephen Vogt. Lichtenstein will be directing the pitching staff for the third-straight season in Montgomery. The Chicago-native spent three seasons as pitching coach in Bowling Green before joining the Biscuits in 2012. Overall, Lichtenstein starts his tenth season in the Rays organization. In only two seasons with the Biscuits, Lichtenstein has seen a few talented prospects go from the Biscuits all the way up to the Rays. Alex Colome, a Dominican flame-thrower, pitched under Lichtenstein in 2012 and debuted on the mound last year for the Rays. Enny Romero, a hard-throwing lefthander also from the Dominican Republic, started with the Biscuits last year before making it to the Majors as a September call-up. Russell returns to the Biscuits for the third straight year as the trainer. The Florida-native enters his eighth season with the Rays and eleventh in professional baseball. A University of South Florida graduate, Russell earned his Bachelor's of Science in Athletic Training in 2004. The Biscuits will open their season on Thursday, April 3 against the Birmingham Barons with first pitch scheduled for 7:05 at Riverwalk Stadium. Written by Aaron Vargas Brady Williams Photo Credit: Nick Martinez This story was not subject to the approval of the National Association of Professional Baseball Leagues or its clubs.